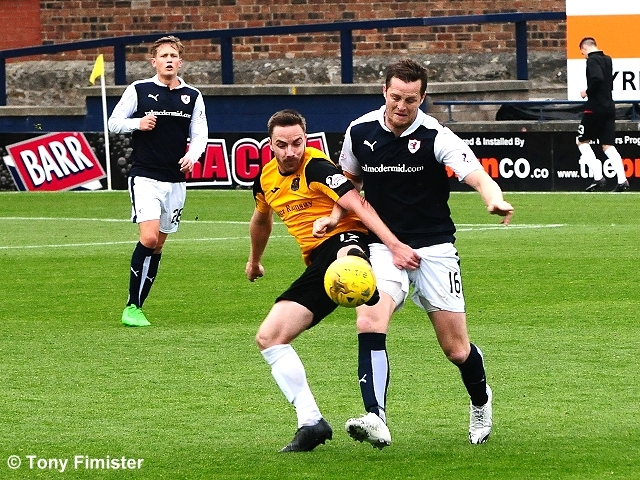 Raith Rovers moved up to third place in the Championship table courtesy of a hard fought 1-0 win against Dumbarton at Stark’s Park this afternoon. 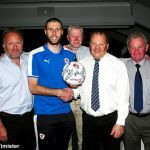 Man of the Match Lewis Toshney’s first goal for Rovers was sufficient to separate the two sides who generally matched each other during an intriguing if rather uninspiring ninety minutes. 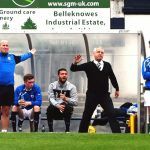 The home side appeared somewhat sluggish during the opening exchanges, the consensus among the Rovers faithful being that a demanding midweek cup clash against Celtic had had an adverse effect on the team’s performance. 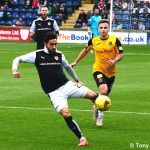 That said, the visitors, despite opening their league campaign with impressive wins against Hibs and St Mirren, had lost four of their last five matches, and trailed Ray McKinnon’s men by five points prior to kick-off. 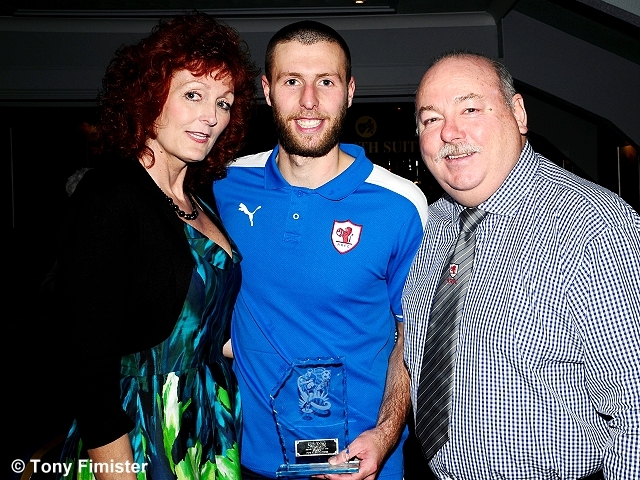 It was the Sons who registered the first shot at goal after five minutes, although Jon Routledge’s effort from outside the box failed to test Rovers custodian Kevin Cuthbert. 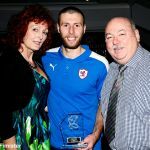 The home side responded immediately with two corner kicks in quick succession, the second of which found Kyle Benedictus lurking with intent at the back post, although the defender’s header drifted harmlessly wide of the target. 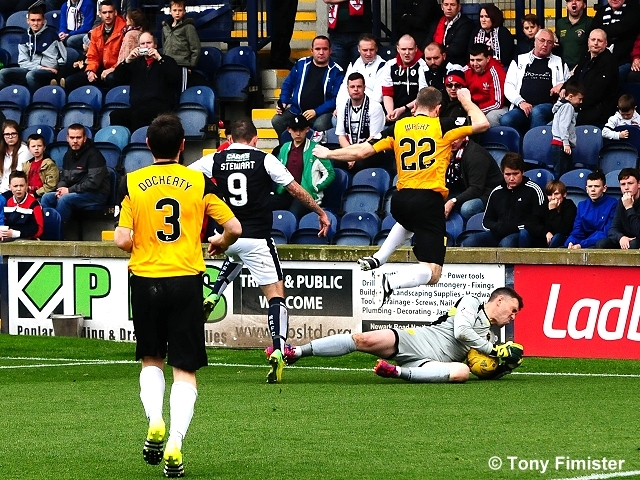 With ten minutes played, Eamonn Brophy found himself in space inside the Rovers box, and his low shot flew narrowly past the upright from an acute angle. 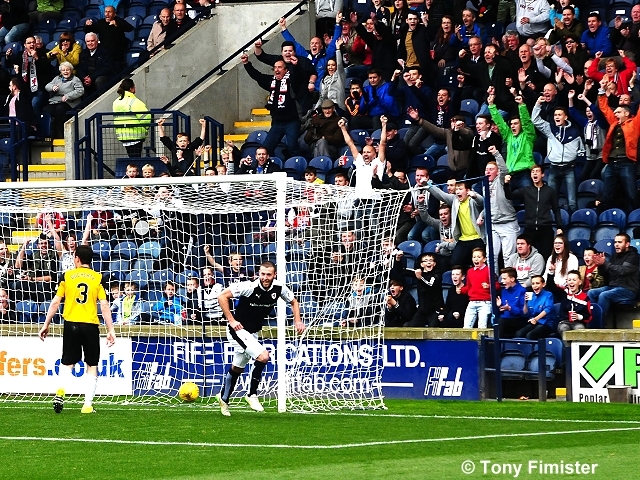 Rovers boss McKinnon had sent his charges out with clear attacking intent, with Jon Daly partnered by Craig Wighton in attack, and Mark Stewart in a supporting role on the left flank. 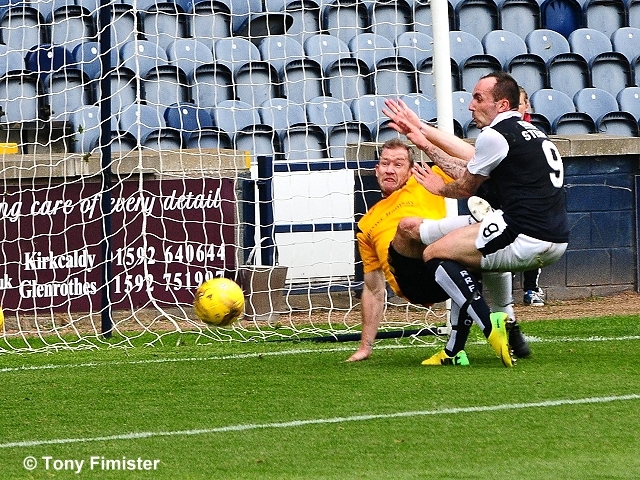 After quarter of an hour, an ambitious overhead kick by Daly sailed over bar, before at the other end a darting Brophy run through the middle was thwarted by a perfectly timed sliding tackle by Jason Thomson as the striker prepared to shoot. As the first half progressed, clear goal scoring opportunities were at a premium, though both sides looked dangerous from set pieces. 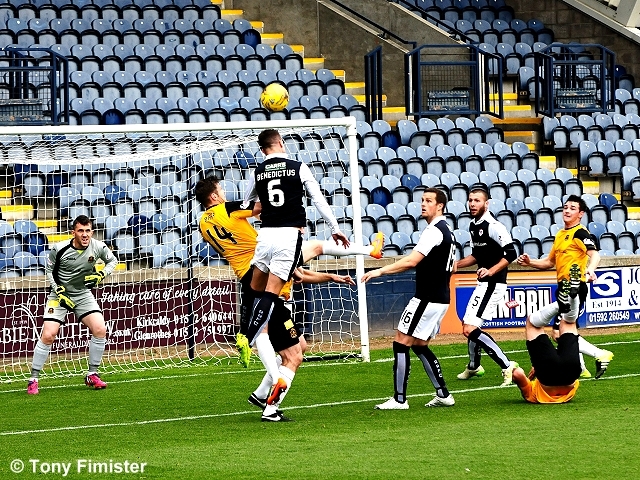 From one flighted cross from Ryan McCord, a Benedictus header landed neatly at the feet of Mark Stewart, but hesitation on the part of the striker afforded the defence time to clear their lines. 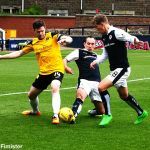 Stewart then turned provider, his arching cross from the left touchline narrowly evading a touch from the galloping Wighton deep within the Dumbarton penalty area. 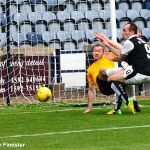 The ever-eager Stewart was in the thick of the action, and he brought a diving save from Mark Brown in the visitors’ goal ten minutes before the interval. 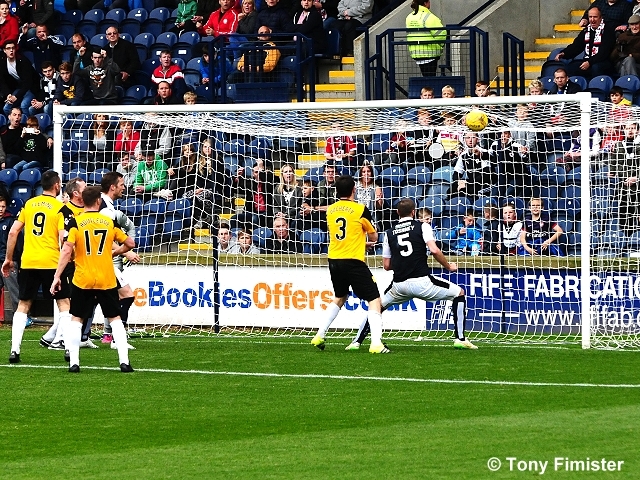 Rovers then fashioned two further chances before the first half came to a close, the first of which was scrambled clear following a Grant Anderson cross that was spilled by Brown, then Anderson tried his luck with a flashing header from Rory McKeown’s cross that shaved Brown’s crossbar with the keeper rooted to his line. 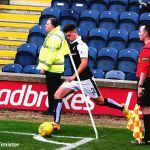 On the stroke of half time Benedictus received the first caution of the game for a crude trip on Willie Gibson right under the nose of the referee. 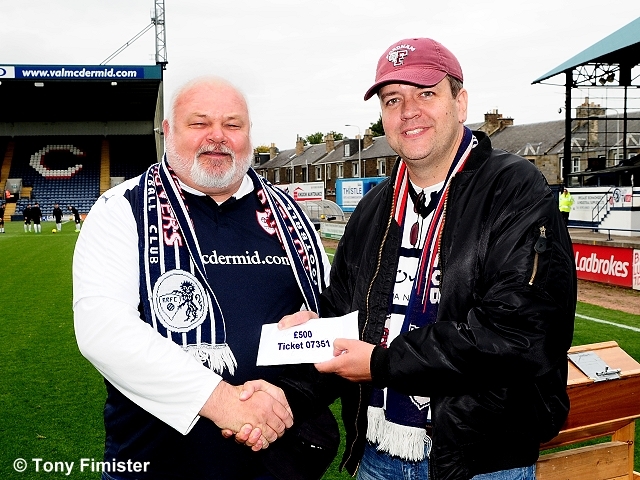 Following a tepid opening to the second half, James Craigen failed to trouble Brown with a free-kick from a promising position on the edge of the box, and then the visitors spurned a glorious opportunity to open the scoring when Kevin Cawley, in acres of space in front of goal, conspired to head over the bar with the goal at his mercy. 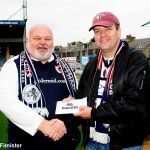 Perhaps conscious of their fortune, Rovers quickly made their opponents pay for such wastefulness by scoring the opening goal just shy of the hour mark. 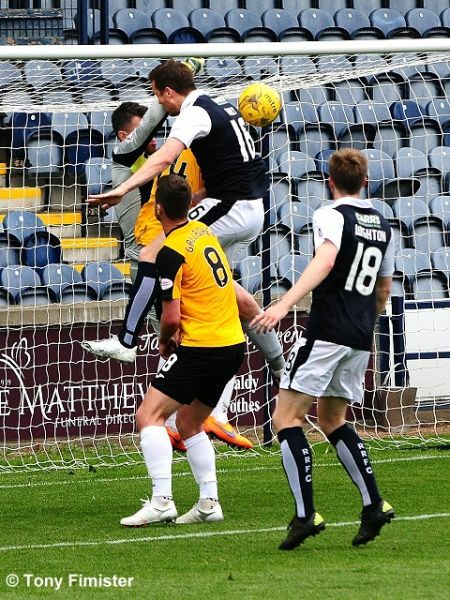 Craigan’s free-kick was met with a firm header at the far post from Benedictus, and the ball smacked off the bar before landing at the feet of the lurking Toshney, who guided the rebound into the roof of the net from close range with the minimum of fuss. 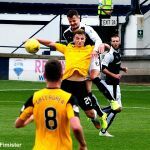 Shortly after, Rovers skipper Thomson, who enjoyed a fine afternoon patrolling the right flank, took an accidental kick in the face. 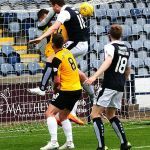 Astonishingly, the game was allowed to continue, and as the right back lay prone on the turf on the edge of the penalty area, the visitors almost took advantage to equalise. 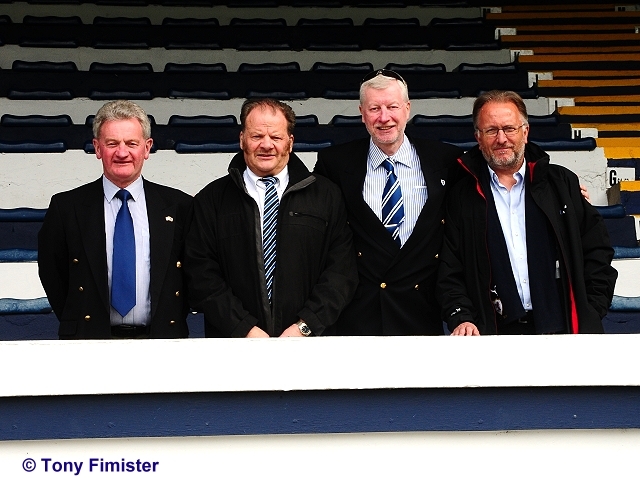 However, the Rovers defence held firm. 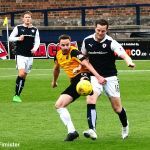 Grant Anderson was then replaced with former Dumbarton striker Mitch Megginson, and the substitute almost made an instant impression, though his speculative short from 25 yards drifted harmlessly wide. 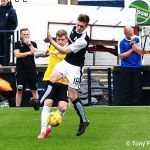 The visitors, keen to restore parity, then enjoyed a period in the ascendancy, and McKinnon responded by replacing the tiring Wighton with Darren Petrie in a bid to bolster the midfield. 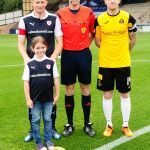 This appeared to lift the home side, and despite a double substitution by Sons boss Steve Aitken, it was Rovers who came close to doubling their lead with ten minutes remaining, although Daly’s audacious overhead kick was confidently clutched from under his cross bar by the alert Brown. 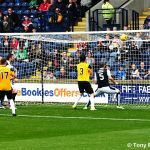 Daly then set up Benedictus with a clever header, although the defender’s volley sailed over the bar from a promising position ten yards from goal. 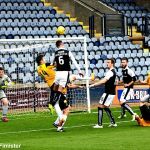 Dumbarton then came close to an equaliser, but a brave blocking tackle by Thomson maintained Rovers’ slender advantage as the clock reached the ninety minute mark. 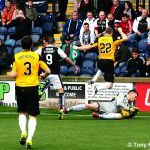 Rovers saw out the remaining minutes relatively comfortably, with McKeown picking up a booking for kicking the ball away in the dying seconds. 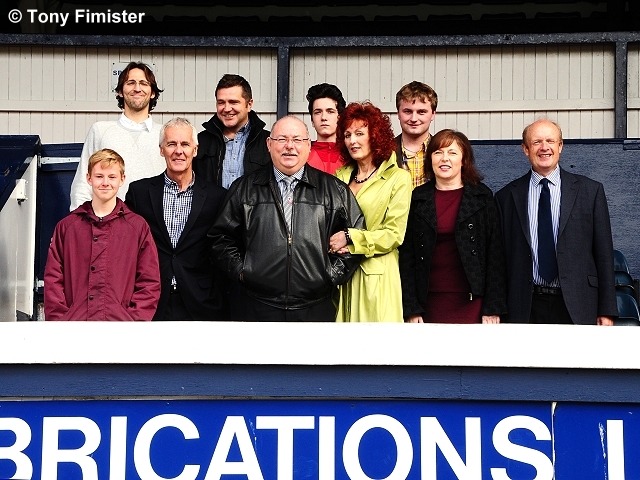 In truth, there was little to separate the sides during this match, and for that reason those of a Rovers persuasion will be particularly grateful to secure the win, one which preserves their unblemished home record in the league thus far. 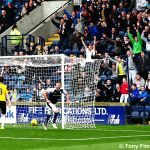 That’s three league wins on the spin for Rovers, and the side can look towards next week’s home clash with Morton with renewed confidence. Close! 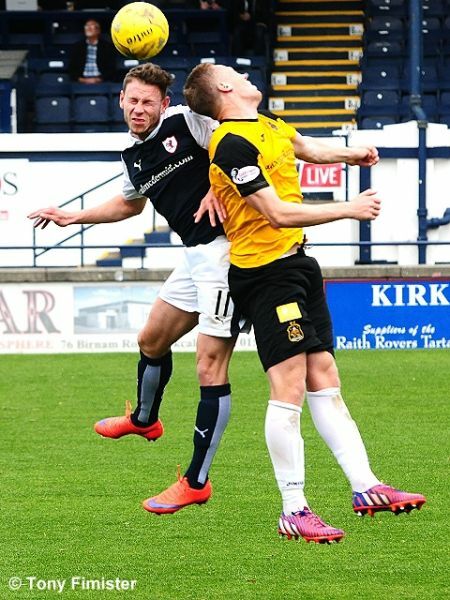 McKeown's disguised cross reached Wighton at the back post, but it seemed to take him by surprise as well! 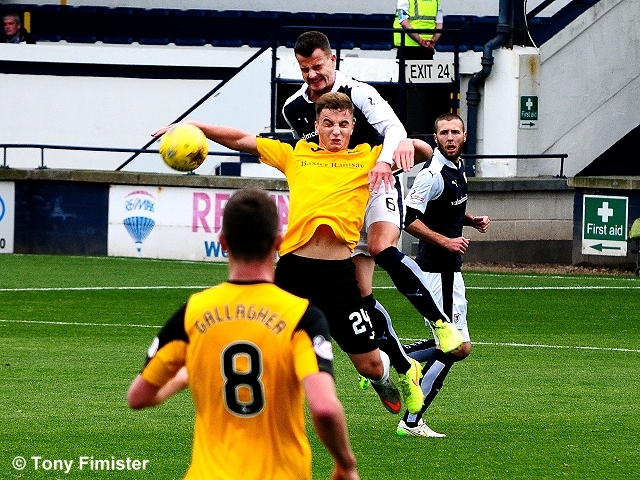 Bizarre decision, Daly was tripped running in on a through ball, but the free kick goes to Dumbarton! 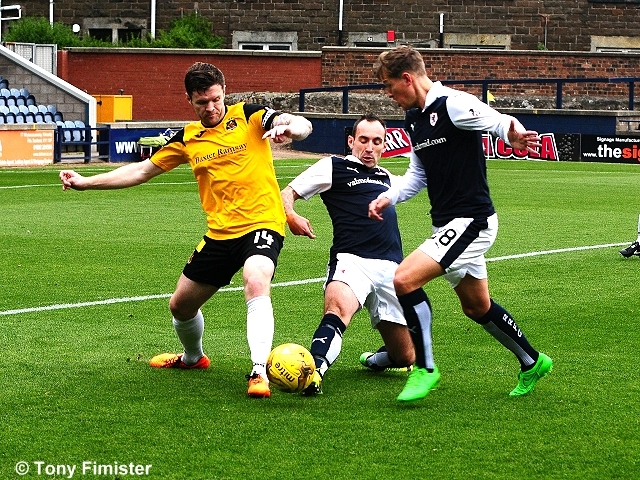 After an impressive performance against Celtic in the League Cup on Wesnesday, Raith Rovers return to Championship duty this Saturday, looking to make it three league wins in a row, with Dumbarton the visitors to Stark’s Park. 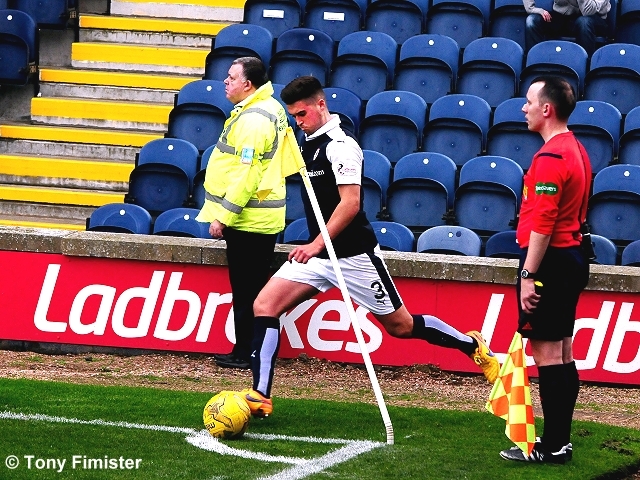 Steve Aitken’s side made an excellent start to their campaign, with two victories over Hibernian and St. Mirren in their opening two fixtures, however, the 2-1 win in Paisley in mid-August, was their last of any kind, and they currently sit seventh in the Championship table. 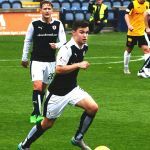 Aitken replaced Ian Murray as Dumbarton manager in the summer, and he wasted little time in building almost an entirely new side at the Cheaper Insurance Direct Stadium, bringing in an impressive array of talent in the build-up to the new season. 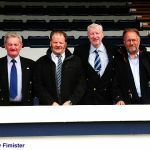 Goalkeeper, Mark Brown joined after leaving Ross County, while the defence was bolstered by the acquisitions of Gregor Buchanan from Dunfermline, Frazer Wright from St. Johnstone, former Hearts defender, Darren Barr, and left-back Mark Docherty from Alloa. 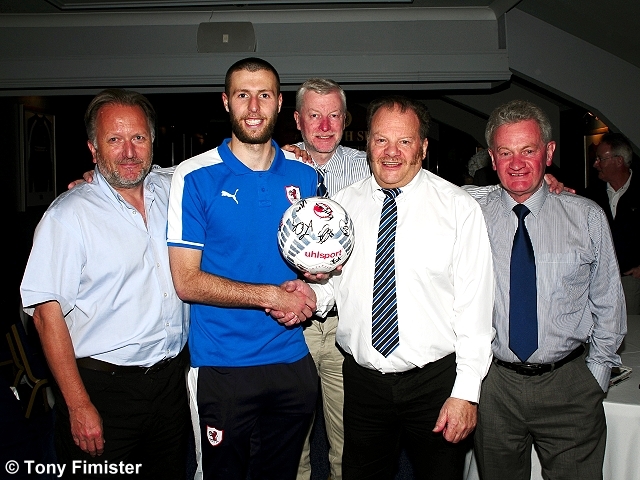 In midfield, Willie Gibson and Grant Gallagher both followed Aitken from Stranraer, and both have already chipped in with important goals this term. 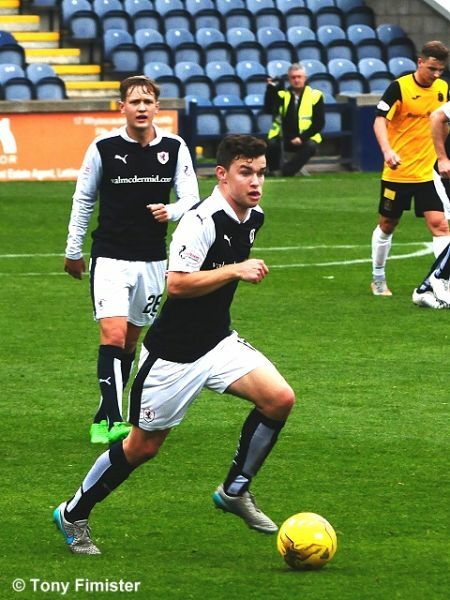 Ex-Hamilton player, Jon Routledge has impressed as the anchor man in midfield, and John Lindsay, who played against Raith in a pre-season friendly for Celtic, has also joined on-loan. 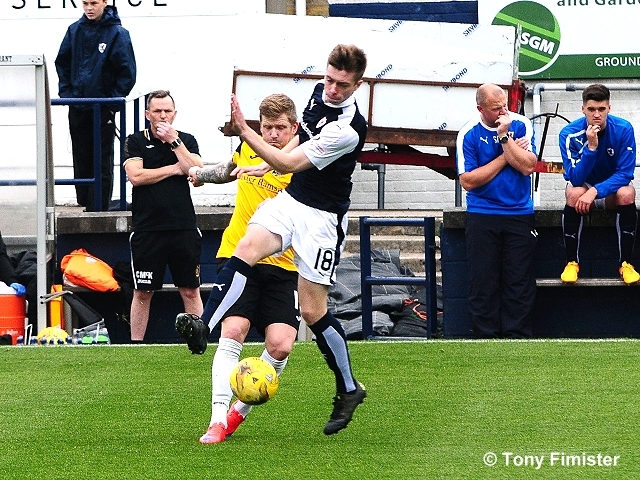 The forward positions will be contested by Eamonn Brophy, who has joined on-loan from Hamilton after impressing in the Development League, and Steven Craig, who had a spell as a youth player at Stark’s Park earlier in his career. 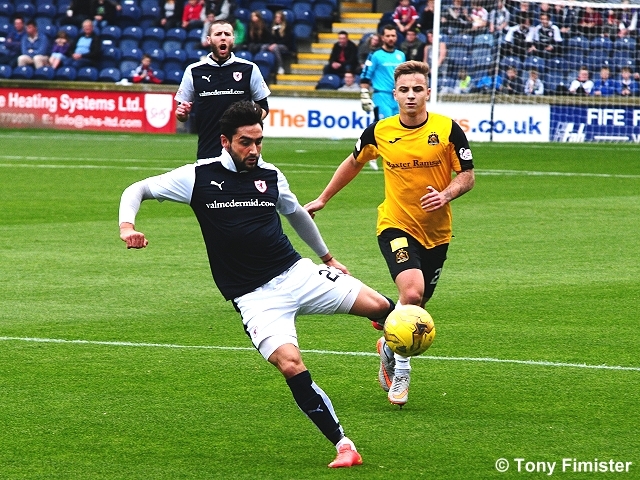 Raith Rovers will be looking to reproduce the form which saw them win both these fixtures last season. 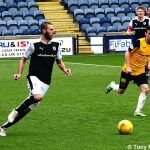 Paul Watson, Ryan Conroy and Christian Nade put Raith three up on the opening day of last campaign, while Scott Agnew scored a late consolation for the Sons. 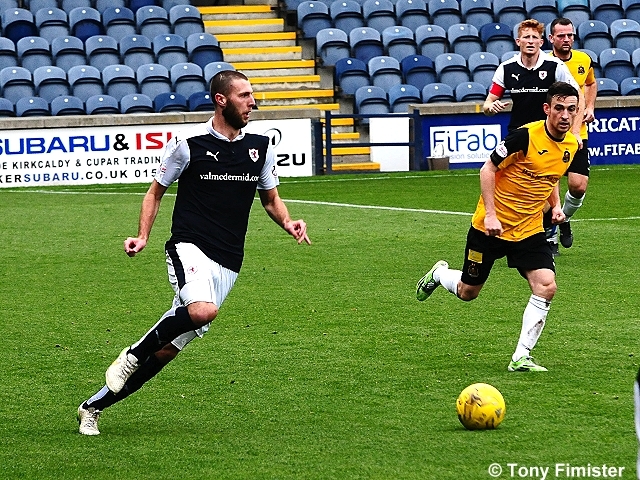 Their last meeting in Kirkcaldy was in January, with Conroy again on target, along with and Grant Anderson as Raith ground out a 2-1 win. 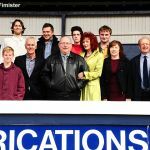 Dumbarton have only won once at Stark’s Park on league business in 32 years, a 3-1 win following Rovers Ramsdens Cup victory in 2014, but they have managed two cup wins in Kirkcaldy during that time, the most recent coming in 2006, with a 1-0 triumph in the second round of the Scottish Cup. Rovers have the edge in the most recent head-to-head record between the sides, with five wins and two draws from the last ten meetings. 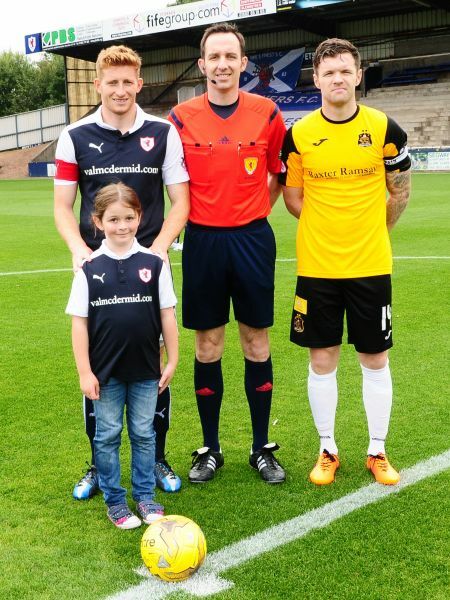 Saturday’s match referee will be Barry Cook.